At the conference for Chabad rabbis serving the Caribbean Islands and Mexico’s Caribbean coast, from left: Rabbi Levi Stein, Puerto Rico; Rabbi Moshe Nemni, Martinique; Rabbi Moishe Chanowitz, St. Maarten; Rabbi Shimon Pelman, Dominican Republic; Rabbi Mendel Zarchi, Puerto Rico; Rabbi Mendel Druk, Cancun, Mexico; Rabbi Moshe Kotlarsky, vice chairman of Merkos L’Inyonei Chinuch, the educational arm of Chabad-Lubavitch; Rabbi Asher Federman, U.S. Virgin Islands; Rabbi Mendel Goldberg, Playa Del Carmon, Mexico; Rabbi Berel Pewzner, Cayman Islands; Rabbi Boruch Rozmarin, Grenada; and Rabbi Ahron Blasberg, Aruba. Summer has come early to Puerto Rico, and in the backdrop of such balmy weather, a local businessman named Chaim found himself sitting recently around a table laden with kosher food, together with a dozen black-hatted, bearded rabbis. It was a far cry from when he first landed on the U.S. territory for business back in the winter of 1990. 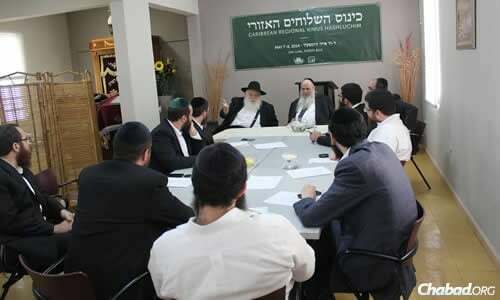 As the “founder” of the first Chabad center in the Caribbean and a key force behind its growth, Chaim—who requested that his full name not be published—was invited to be the lead speaker at the recent regional conference of Chabad rabbis earlier this month, which was attended by Chabad rabbis serving the Caribbean Islands, as well as two from Mexico (Cancun and Playa del Carmen) and senior Chabad officials from New York. Chabad’s involvement in the Caribbean dates back nearly 60 years to 1957. At the time, Rabbi Yehuda Krinsky, now the chairman of Merkos L’Inyonei Chinuch, the educational arm of Chabad-Lubavitch, and the late Rabbi Leibel Raskin, who went on to serve as a shaliach, or Chabad emissary, in Morocco, were sent by the Rebbe—Rabbi Menachem M. Schneerson, of righteous memory—to travel from island to island, bringing Torah literature and a personal connection from the outside Jewish community to Jewish people in Puerto Rico, Jamaica and the Dominican Republic. Throughout the years, young “Roving Rabbis” also hopped from island to Island—even making clandestine visits to Cuba. In 1999, Rabbi Mendel and Rochie Zarchi would be the first Chabad couple to move full-time to serve local Jewish residents and the numerous tourists who flock year-round to the Caribbean’s emerald seas and pristine sands. 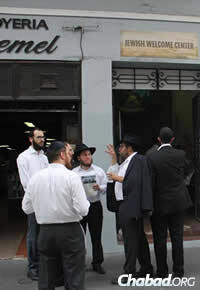 Chabad rabbis at a conference in Puerto Rico earlier this month linger outside the "Jewish Welcome Center" in Old San Juan. 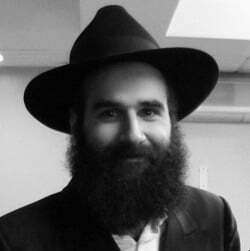 Beyond Puerto Rico, Rabbi Zarchi quickly became the point person for Judaism in the Caribbean, as communities turned to him to facilitate certain services, as well as entreat the presence of “Roving Rabbis” sent from the Chabad-Lubavitch headquarters in Brooklyn, N.Y. 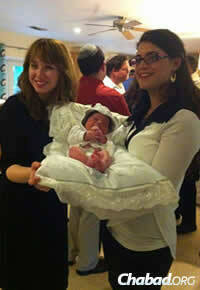 In time, he worked with headquarters and donors to bring permanent Chabad couples to a growing number of islands. 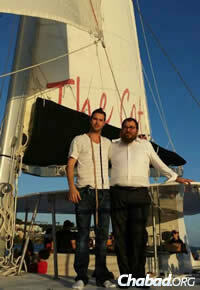 Nine Chabad couples now call the Caribbean islands home, two serve Mexico's Carribean coast—and more are on their way. Joining the Zarchis, Rabbi Asher and Henya Federman moved to the U.S. Virgin Islands in 2005. They were followed by Shimon and Michal Pelman, who moved to the Dominican Republic in 2008. The following year, Rabbi Moshe and Simcha Nemni founded Chabad-Lubavitch of Martinique, and Rabbi Moishe and Sara Chanowitz settled in St. Maarten. On the Mexican coast, Rabbi Mendel and Rachel Druk opened the doors of Chabad Jewish Center of Cancun in 2006, and Rabbi Mendel and Chaya Goldberg opened a branch in Playa del Carmen in 2010. 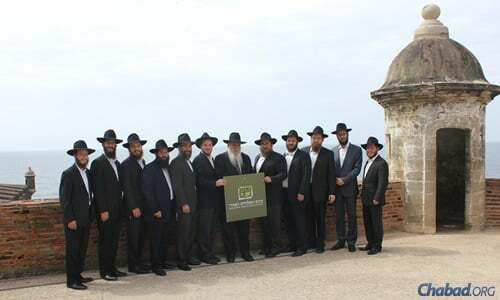 Chabad of Puerto Rico opened a satellite branch in Old San Juan under the directorship of Rabbi Levi and Leah Stein in 2011. In 2013, Rabbi Berel and Rikal Pewzner moved to Grand Cayman Island; Rabbi Boruch and Chaya Rozmarin set up a Chabad on Campus for Jewish medical students in Grenada; and Rabbi Ahron and Chaya Blasberg made Aruba their home in the very end of December, catching the last few weeks of the major tourist season. Rabbi Moshe Kotlarsky, seated in front of the podium, and to his left, Rabbi Shlomo Zarchi—dean and mashpia of the Central Yeshiva Tomchei Tmimim at Chabad-Lubavitch World Headquarters at 770 East Parkway in Brooklyn, N.Y.—share words of inspiration and guidance with the Caribbean rabbis during the multi-day conference. Rabbi Asher Federman assists a man putting on tefillin while boating off St. Thomas. 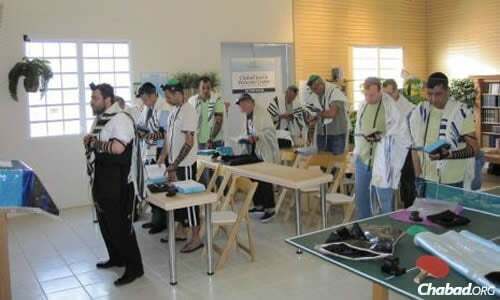 Blasberg is quick to point out that the warm reception is largely due to the personal connections and goodwill fostered by the young rabbis who have been visiting the island for decades. In fact, the Jewish prime minister of the Dutch state, Mike Eman, has had a longstanding relationship with these Chassidic men, from whom he even received his own pair of tefillin. While Chabad on Aruba is still in its infancy, the Chabad centers in some of the other islands have grown beyond anyone’s expectation. Both Puerto Rico and St. Thomas boast daily prayer services, kosher catering facilities and satellite welcome centers near cruise terminals. They are also in the midst of constructing spacious new centers that will host mikvahs and other amenities. Federman leads the morning minyan (prayer service) at Chabad of St. Thomas. Eighty miles of blue sea to the east, Rabbi Federman says he sees similar dynamics. Federman explains that the center currently being built, which is being constructed with seed money supplied by the late philanthropist Sami Rohr family on a hilltop with a sweeping panoramic view of the ocean, will help accommodate the crowd, in addition to creating a larger home for Chabad’s activities and programs. At the same time, he says that he and his family will be living on the one-acre campus so that it retains the homey atmosphere that attracted people in the first place. Like the St. Thomas Chabad center, the 11,000-square-foot facility currently being built in Puerto Rico is a tribute to the generosity of the Rohr family and many local donors, including Saul Scherl, a developer whose firm has taken responsibly for the construction and who is co-chairing the project with Chaim. The network of Chabad centers and rabbis has broadly expanded the vacation options for Jews looking to unwind without relaxing their religious observances. The availability of kosher food, prayer services, Torah classes—and now even mikvahs—provides unprecedented opportunity for Jews to take a vacation and uphold their religious standards. Reflecting on the regional transformations that have snowballed as a result of his initial phone call and support, Chaim helps paint a larger picture. Did not CHABAD realize that it is their presence which makes these places even more beautiful. We live in a so called 'tropical paradise' here in Cairns, Queensland Australia and it fills our hearts with joy when we see the 'black hats' walking down the street having come from those Jewish areas in the far south of this vast country to keep us 'jungle Jews' firmly in the heart of Abram. Barakha and multiple blessing on you all.